Drawing on social media, cinema, cultural heritage and public opinion polls, this book examines Indonesia and Malaysia from a comparative postcolonial perspective. The Indonesia–Malaysia relationship is one of the most important bilateral relationships in Southeast Asia, especially because Indonesia, the world’s fourth most populous country and third largest democracy, is the most populous and powerful nation in the region. Both states are committed to the relationship, especially at the highest levels of government, and much has been made of their ‘sibling’ identity. The relationship is built on years of interaction at all levels of state and society, and both countries draw on their common culture, religion and language in managing political tensions. In recent years, however, several issues have seriously strained the once cordial bilateral relationship. Among these are a strong public reaction to maritime boundary disputes, claims over each country’s cultural forms, the treatment of Indonesian workers in Malaysia, and trans-border issues such as Indonesian forest fire haze. Comparing the two nations’ engagement with cultural heritage, religion, gender, ethnicity, citizenship, democracy and regionalism, this book highlights the social and historical roots of the tensions between Indonesia and Malaysia, as well as the enduring sense of kinship. "In 2015 extensive forest fires in Indonesia blanketed Southeast Asia in a thick haze that lasted for months. 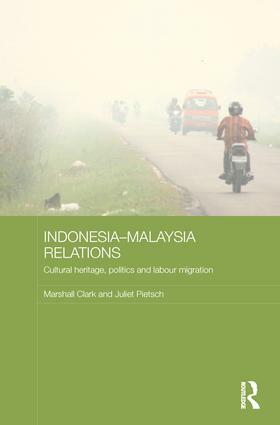 The haze problem is a recurring transnational issue that this book discusses as well as other disputes, such as those over cultural icons in Southeast Asia….It is a significant contribution to our understanding of the complex love-hate relationship between Indonesia and Malaysia." Marshall Clark is Director of the Australian National Internships Program and a Senior Lecturer at the School of Politics and International Relations at the Australian National University. He is the author of Maskulinitas: Culture, Gender and Politics in Indonesia. Juliet Pietsch is a Senior Lecturer of Political Science at the School of Politics and International Relations at the Australian National University. Juliet is a Principal Investigator of the Australian Election Study, the World Values Survey and the National Asian Australian Survey.